I have just noticed that virtually all my wild food recipes are exclusively vegetarian, so it is time to get more carnivorous so to speak. A couple of years ago when I was in the mountains of northern Italy I had a really nice Italian meal (where no pasta was involved for a change!) which consisted of a whole wood pigean stuffed with peaches. Not being able to speak Italian I have no idea how the cook prepared it, so I thought I would try and create something similar. The main idea of the recipe is to create a naturally sweet sauce to compliment the gamey meat. To me personally I think wood pigeon is a really underrated as a game bird and I much prefer it to pheasant, but no one seems to eat it anymore. Being a westcountry lad, I've added some westcountry cider to this recipe but you could use any good quality dry cider. 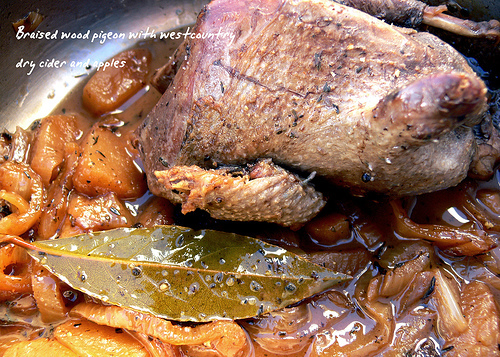 Ingredients: wood pigeon, organic dry westcountry cider, apples, onion, olive oil, butter, bayleaf, sprig of thyme. First fry the wood pigeon, onions and apples in olive oil until golden brown and then place in a deep saucepan. Cover the ingredients with cider and braise on a low heat for about an hour. Remove the ingedients from the pan and then reduce the liquid down to a required quantity. You should produce a fairly sweet and thick sauce to pour over the wood pigeon. Could you give me ingredient amounts please, such as how many apples and onions and how much cider, olive oil, butter, etc?